In classrooms across the country, students might be scolded for using “ain’t” instead of “isn’t.” But a UW-Madison student is working to erase the stigma against Ebonics, also known as African-American Vernacular English. 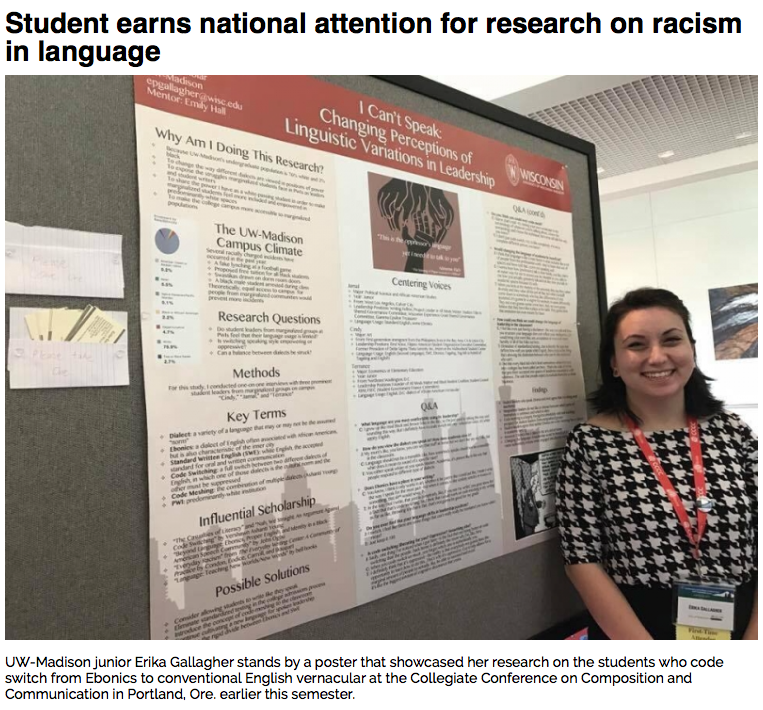 UW-Madison junior Erika Gallagher conducted research about code switching, also known as code meshing, in which people change their regular speech tendencies to fit into the mold of what is commonly accepted as appropriate. Ebonics is a variety of English that is commonly found in the center of large cities that have been historically populated primarily by black people. It is commonly found in slam poetry, as well as hip-hop and rap music. Gallagher, a Posse scholar, began her research during her time as an undergraduate Writing Fellow this semester. She said she realized, as she sat in her seminar class of predominantly white students, that she wanted to focus on standard written English and how it excludes marginalized groups.